First Lines Fridays is a weekly feature for book lovers hosted by Wandering Words. Judge a book by its opening lines, and not by its cover! I’ve given the banner a revamp, so it fits in much better with the rest of the site now – I’ll be going back through my old FLF posts and jazzing those up too. Feel free to use it with your own First Lines Fridays posts! 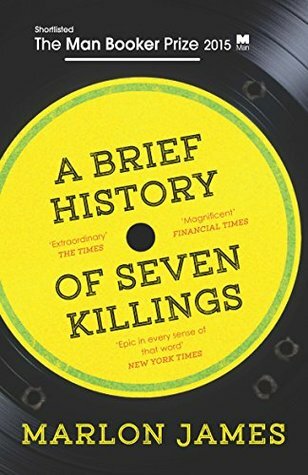 Inspired by this near-mythic event, A Brief History of Seven Killings takes the form of an imagined oral biography, told by ghosts, witnesses, killers, members of parliament, drug dealers, conmen, beauty queens, FBI and CIA agents, reporters, journalists, and even Keith Richards’ drug dealer. Marlon James’s bold undertaking traverses strange landscapes and shady characters, as motivations are examined – and questions asked – in this compelling novel of monumental scope and ambition. If this book looks familiar, it is because it won last year’s Man Booker Prize, and my post about the winner can be read here. I actually got it out from the library a little while ago to read, but with a whole pile of other books to read first, I might end up just returning it, sadly. Next Post Is Goodreads Good for Reading?